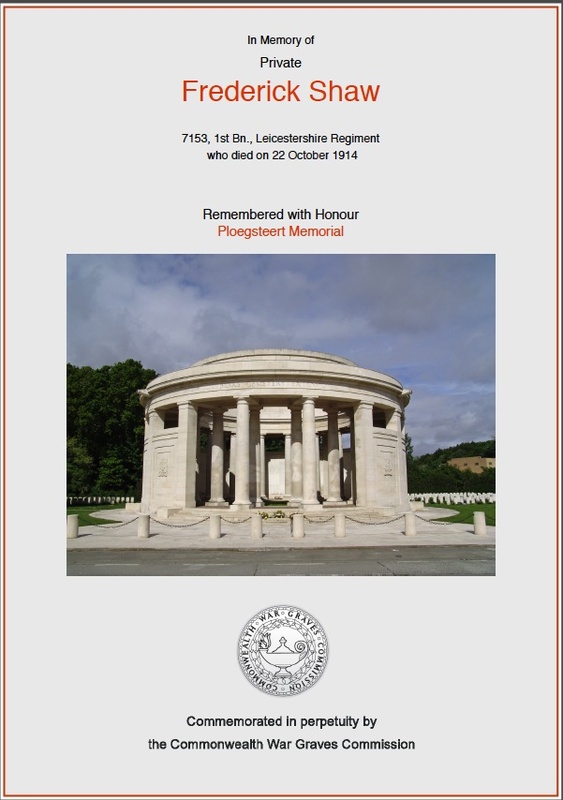 Frederick Shaw was the first casualty from Bottesford to be killed in action on the 22 October 1914. His name was 93rd to be read out on Thursday 14th August 2014 as part of the Roll of Honour at the Tower of London. This reading commenced at sunset, 8.40 pm and closed with the sounding of the Last Post. As a reservist with the Leicestershire Regiment he was one of the first to re enlist. He served with the British Expeditionary Force in France from the 9th September 1914. 21 Oct Wed. Ordered to relieve W. YORKS in CHEMICAL FACTORY – RUE DE BOIS line at 8. pm. Casualties 1 killed, 1 wounded. 22 Oct Thurs. Field trenches heavily shelled by Sharpnel & Heavy Howitzers all day [.] Casualties, Lt Prain & Lt Dods killed [.] Lt Smeathman wounded & died. 11 Other ranks killed & 25 wounded. Frederick Shaw’s name is inscribed on the Ploegsteert Memorial, in Flanders. He was awarded the Victory Medal and the British Medal with clasp 2/2691. Frederick Shaw was born in 1885 in Friskney Lincolnshire. His parents were John and Elizabeth Shaw. John Shaw was also born in Friskney in 1851 and Elizabeth was born in Hagnaby, Lincolnshire in 1852. In 1891 Frederick James Shaw was living with his parents and family on Low Road, Friskney. There were 8 children in the family – Phoebe (14), Walter (12), Miriam (11), Moses (9), Charles (7) Frederick (5), Alice (3) and Elsey (1). His father was listed as a farmer and Frederick was at school. Aged 17, in 1901 Frederick was living in Bottesford with his grandfather Joseph G. Shaw (aged 68). 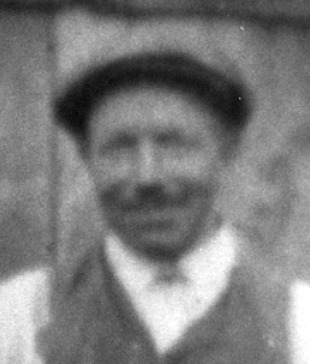 Joseph Shaw, an agricultural labourer, lived on Market Street next to the barber’s shop and to Herbert Copeland the draper. Frederick was also an agricultural labourer. His parents had also moved into the locality to live at Scarrington where his his father worked as a shepherd. Also living locally, his brother, Charles Percy Shaw, worked at Waltham as an under waggoner boarding at his place of employment. Fred worked for the Palmer family farmed at Beckinthorpe Farm for 8 years until war was declared in August 1914. When Fred re enlisted in Leicester he gave his brother’s address as his residence.